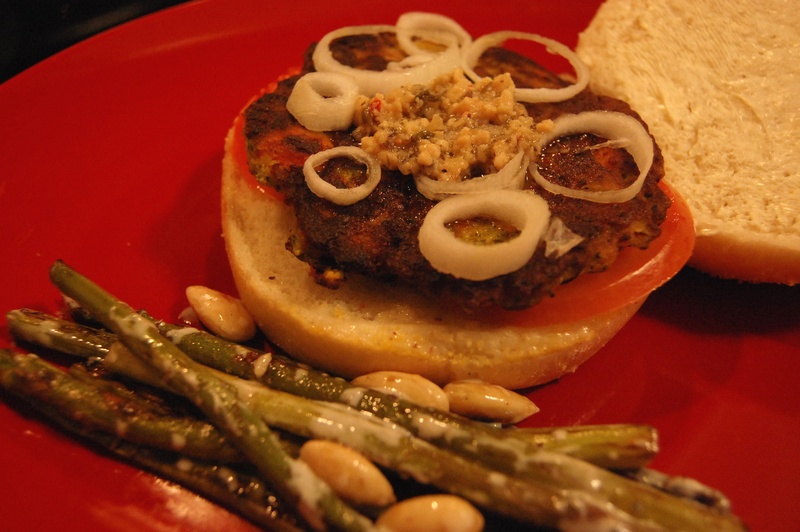 I came up with this recipe when I wanted to have a nice burger filled with vegetables. You know how I have my phases – I get obsessed with certain things for short periods of time and keep coming back to them ad-nauseam, be it colours (For a long time I couldn’t look beyond purples and greens, and don’t even get me started on how many white cottons I had back in India), or a genre of books (I read so much fantasy in 2011 that I wouldn’t have been surprised at all to see a knight galloping down the road with a sword in his hand or a wizard performing magic) or TV series (I fell for Mad Men hook, line and sinker; currently, I’m watching episode after episode of Agatha Christie’s Marple). The story is no different for the ingredients I use. Right now, I’m on broccoli. And I’m sure you haven’t forgotten, before that it was green chutney. I know my vegetarian friends will complain that this is still not vegetarian because it uses egg. But the egg is only a binding agent here, and if you want to eliminate it and use something else, like say potatoes or cooked rice, go ahead. I wasn’t in the mood for potatoes that night. Add the diced broccoli and carrots to a pot of water and bring it to a boil. Lower the heat and simmer for just about 10 minutes (or even less) until the vegetables are slightly tender. Drain and let cool. In a medium sized bowl, whisk the egg lightly. Add to it the cooked vegetables and mash them to get a slightly chunky mixture. Mix in the flour and cheese, minced garlic, chopped up mint and season with salt and pepper. Mix it all well. Heat a teaspoon of oil in a non-stick frying pan. Drop a large dollop of the broccoli mixture (about a quarter of it) in the pan and press it with the back of the spoon in a patty. Cook till the lower side is slightly browned, then flip the patty over and cook the other side too. Make more patties with the remaining mixture similarly. Assemble your burger, just as you like it. I simply added tomatoes and onions and a garlicky spread. My mixture looks a little runnier than I had meant it to be. This is because in my haste to be done, I did not drain the vegetables well after boiling. This led to thinner patties than I had intended, but the taste was wonderful. This is also Rashmi (Jui’s friend). I usually follow your blog and like it as it collects all “hatke” dishes (& not the usual one). The burger is looking yummy.